2011 GOAL REACHED–NOW, WHO’S NEXT? Three events in December 2011 helped the West Meade Conservancy reach and celebrate its 2011 goal: providing an example of urban conservation by completing its first group of private conservation easements. See photographs on WMC’s website. 1. The WMC’s Second Annual Fun Run added to the fund that covers expenses of the Pilot Group’s conservation easements. 2. Homeowners of the Pilot Group (nine Jocelyn Hollow/Rolling Fork properties) signed official conservation easement documents with The Land Trust for Tennessee. This prompted an article by Anne Paine of The Tennessean and praise from Jeannie Nelson and Audra Ladd of The Land Trust for Tennessee. 3. The Land Trust for Tennessee and The West Meade Conservancy held a Celebration at Westmeade Elementary School in honor of the WMC’s move to a new phase in its mission to protect the wooded hillsides of West Meade for future generations. THERE’S MOMENTUM, LET’S KEEP GOING! The map below shows where property owners have signed unofficial “Registration” forms signaling an interest in preserving individual sections of lots. There are already some contiguous groups waiting to be in the next easement groups. You can look at the map to see if you live next to signed-up properties and to encourage neighbors who might be interested in signing up. Contact Mary Kowalski or Carol Nestler if you’d like to sign a Registration form or if you have questions (353-6606; mlk6510@yahoo.com, carolnestler@yahoo.com). The WMC has raised 92% of the funds necessary for completing its Pilot Group of conservation easements. Plans are underway for a signing ceremony and Celebration in December. The WMC’s Second Garage Sales Day has brought in more than $2,000 so far (there are still some things for sale on consignment). Thanks go to Sales Chairman Nancy Smith and to her host of dedicated volunteers. Saturday December 3rd, 8:30 a.m.
Have Fun, Join the Run!–an event for all ages. Download and complete the form attached to this newsletter and then give or mail it with your check to Kim Matthews, 145 Jocelyn Hills Dr., Nashville, TN 37205. Run Co-Chairmen Kim Matthews and Cindy Smythe need volunteers to help before, during, and after the event. If you can help, call Kim at 739-5238 or Cindy at 356-9419. A recent issue of The NEWS reported Westmeade Elementary’s use of its class set of NOAH AND THE ARC. Do you know other teachers or schools that might like class sets of the book or groups willing to donate such sets? Contact Joanna Carnahan (jec614@att.net; 352-8188). Joanna read the book at a presentation during the Southern Festival of Books. To purchase copies of the book, see “Buy Our Book” on our website. The West Meade Conservancy is open to everyone who cares about the preservation of a beautiful natural area. As the organization has grown its business duties have expanded to require a clearly defined structure. The group of local volunteers (listed below) can always use more help in carrying out the work of the WMC. The time commitment is flexible and the committees appreciate people with a variety of skills. If you are persuasive (Development), enjoy meeting people (Recruitment), have a flair for theatre or like to talk to children (Education), are artistic, interested in design and/or marketing? (Publicity), please contact one or more committee heads to offer help. Executive Council: Ellen Hansen (president), Dan Lindstrom (vice-president), Jane Bibring (secretary), Sharon Charney (treasurer), Cindy Smythe (Development Committee head: 356-9419), Joanna Carnahan (Education Committee head: 352-8188, jec614@att.net), Kim Matthews (Publicity Committee head:739-5238, kimimatthews@comcast.net), Mary Kowalski & Carol Nestler (Recruitment Committee heads: 353-6606). Professional Advisors: Anita Bailey, Brenda Batey, Stasia Holdren, Tom Keller, Kate Rosenthal, George Schnitzer. Alys Venable (liaison). Tues., Sept. 20 Bring tables hosts’ houses. Thurs., Sept. 22 Set up displays and start pricing. Fri., Sept. 23 Finish pricing; tie up loose ends. Sun., Sept. 25 Take down; distribute unsold items to sale workers. The Land Trust for TN and Metro Government spent two years gathering public input and carefully crafting the Davidson County Open Space Plan. 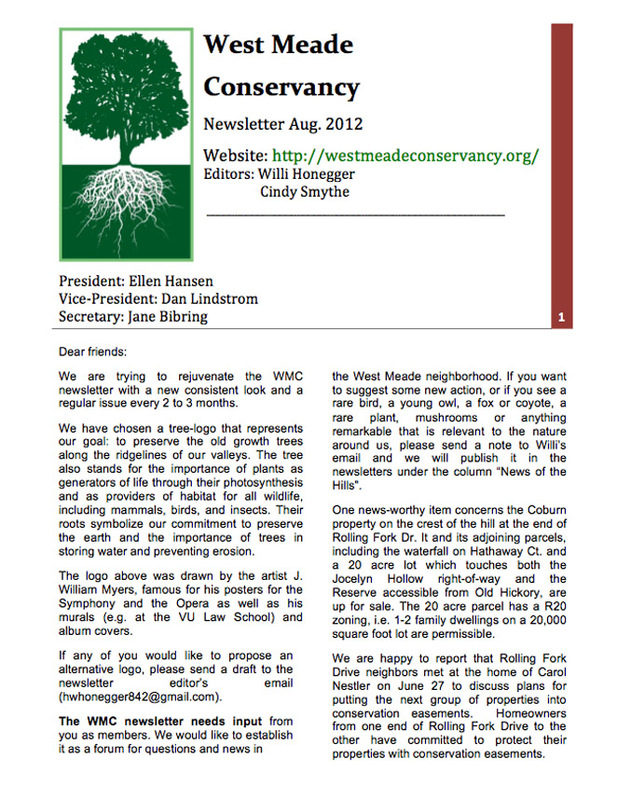 Use the link and take the quiz at the end of this newsletter to discover the part that West Meade’s woods and urban conservation play a part in the Plan. Contact Cynthia Smythe (356-9419; smythed@bellsouth.net). The Sept./Oct. issue of The Tennessee Conservationist, produced by Tennessee’s Dept. of Environment and Conservation, devotes three pages to Noah and the Arc and recommends the book for use in schools and children’s groups. To order a copy or to subscribe to the magazine, call editor Louise Zepp at 532-0060. Westmeade Elementary’s Librarian, Karen McIntyre, is using Noah and the Arc this month in a program for students. Anonymous donors purchased a class set of books for the school. 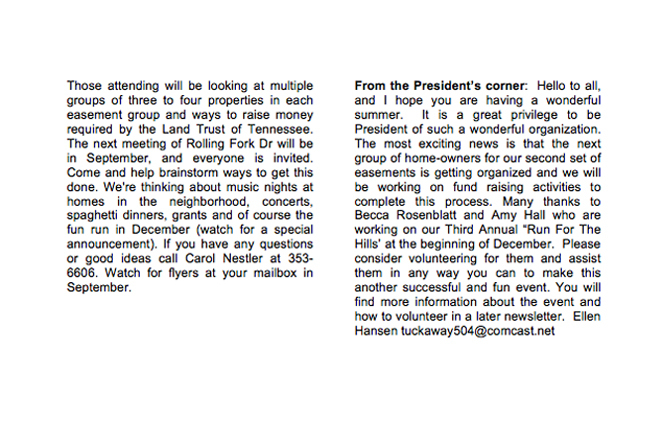 Karen’s reaction to the book and plans for it are part of the article in The Tennessee Conservationist. Create a donor group to fund books for the school of your choice. A class set of 25 books costs $420. To learn more, contact Joanna Carnahan (352-8188; jec614@att.net). Southern Festival of Books Will Include WMC’s Book Noah and the Arc will be on sale at the Festival and will have a place on the program on Saturday, October 15. Come swell the audience for a reading/signing program at 12:15 pm, Legislative Plaza, the Children’s Books tent. 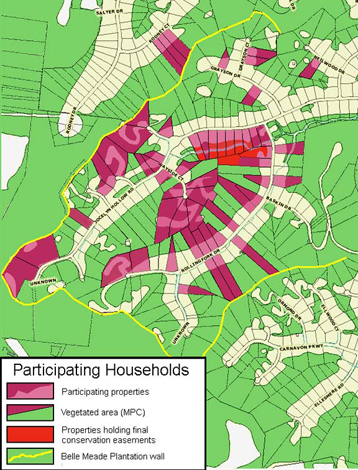 TAKE THE DAVIDSON CO. OPEN SPACE PLAN QUIZ to find West Meade’s and The West Meade Conservancy’s importance. Volunteers needed for logistics: Contact Cynthia Smythe (356-9419; smythed@bellsouth.net). Details in next newsletter. WMC’s Book Featured in State Magazine The Sept./Oct. issue of The Tennessee Conservationist, produced by Tennessee’s Dept. of Environment and Conservation, devotes three pages to Noah and the Arc and recommends the book for use in schools and children’s groups. To order a copy or to subscribe to the magazine, call editor Louise Zepp at (615) 532-0060.
the program on Saturday, October 15. Come swell the audience for a reading/signing program at 12:15 pm, Legislative Plaza, the Children’s Books tent. Start collecting items to contribute. Starting Sep. 1, bring items to 6573 Jocelyn Hollow Rd. for the big day! Put a copy of this newsletter in the mailbox of a new neighbor. One of the purposes of the West Meade Conservancy’s gathering last Saturday was to remind people of the group’s mission and of that mission’s value. You can read reports of the gathering in the NEWS, but two WMC supporters took the trouble to put into writing what they see as the group’s importance, and what they’ve written is worth sharing. Don’t miss their words–right after the “business” parts of this newsletter. Volunteers needed! The WMC will have a tent at the Nashville Earth Day Festival in Centennial Park on Saturday, April 23. Jane Bibring is coordinating the WMC’s display and needs volunteers to sit at the WMC’s tables for the following times: 9:00 -11 am (setting up); 1-3 pm; 3-5 pm; and 5-7:30 pm (taking down–probably will end earlier). The event is fun, and the company is beyond compare. If you can help during one or more of the times, please contact Jane Bibring (356-0977; jane@bibring.net). The West Meade Conservancy serves as a reminder of the importance of controlling our environment so that all residents can live in harmony in this extraordinary natural setting that attracted us in the first place. Through information and education WMC demonstrates the precious balance that exists between development and preservation and the volunteer actions necessary to protect the woods of west Nashville for current and future generations. The ironic by-products of these efforts are increased land values and a remarkable place to live, which is located conveniently to just about anything one would need or want. On first noticing that tiny blurb in the paper about a meeting to form West Meade Conservancy, I knew I wanted to be a part of it. We live in the “flatlands” of West Meade, so have no old trees to save. The only trees on our lot were planted by the couple who moved into this then-new ranch in the 1950’s, and whose son sold the house to us; so some people ask why we want to help conserve old natural parts of our neighbors’ lots. Well, if we help neighbors who live in the hills around us save some of their old trees, then we and our grandchildren get to breathe the air those trees help clean. If we help our neighbors preserve parts of their lots for wildlife to travel through, we and our grandchildren get to live among the natural balance that those bugs and bucks help maintain. And if we work as a neighborhood to keep our part of the city woodsy and healthy, doesn’t that help make the whole city healthier? Of course, helping our neighborhood stay clean and green helps keep property values up: nice if we ever wanted to sell, but we don’t. What we do value is getting to know neighbors who love natural beauty and like working together to take care of it: a big bonus prize for being in WMC. 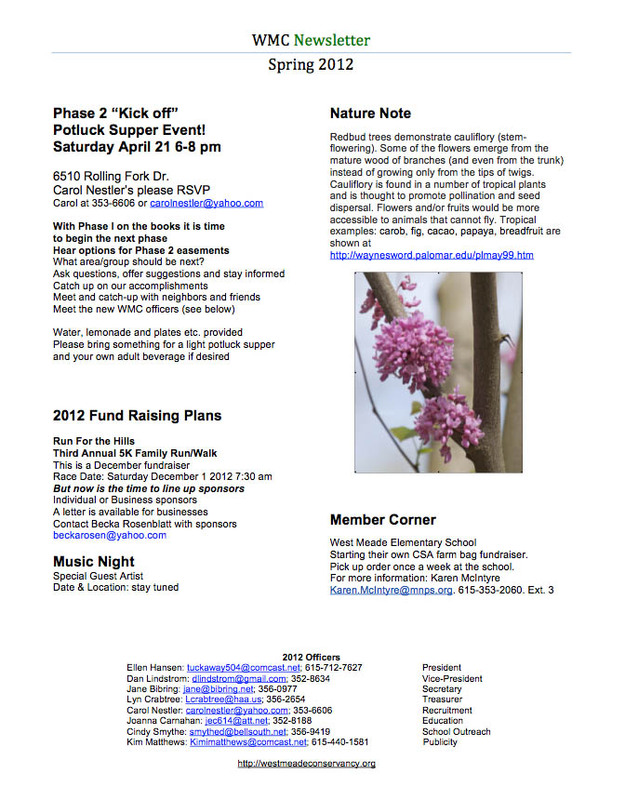 CELEBRATING SPRING AND CATCHING UP WITH THE WEST MEADE CONSERVANCY! 10:00 am – 11:00 am at the circle (after the Dead End sign) on Jocelyn Hollow Rd. It’s also time to celebrate spring, so if you have some photographs (they don’t have to have been taken this year) of spring sights in West Meade’s woods, please bring them to put on posters to be used at the West Meade Conservancy’s exhibit at the Earth Day Celebration in Centennial Park. There will be more turtles to name, copies of Noah and the Arc to view and to purchase, and news to hear. Volunteers, beginning with Elaine and John Purdy, Cindy Smythe, Marna McKinney, Susie Denes, Pat and John Post, and Sharon Charney, have begun putting out flyers attached to advertisement/order forms for Noah and the Arc. There are still more flyers to distribute along Neilwood, parts of Vaughn’s Gap and Robin Hill, parts of Bresslyn and Currywood, Cornwall, Brownlee, Brook Hollow, and in the Carnavon area–wherever you live and wherever you think people would be interested in the WMC’s cause. If you can help, please contact us. Metro Water Services (MWS) will hold a public meeting to review their plan to upgrade combined sewer/stormwater infrastructure in order to reduce or eliminate sewage overflow into waterways. The meeting for West Nashville is on Thursday March 24th, 5-7 p.m. at Metro Public Health Dept. Lentz Center Auditorium (311 23rd Avenue North). Metro Water Services (MWS) is developing of a new volume of the Stormwater Management Manual to encourage Low Impact Development (LID) in Nashville. They will also assess their current floodway and floodplain regulations during this process. For more information see nashville.gov You can send written comments to Sue Amos, Metro Water Services, 1600 Second Avenue North, Nashville, TN 37208 or email sue.amos@nashville.gov. FAMILY FUN RUN Wins Friends and Makes Money! 10 sponsors of “Run for the Hills” and 94 registrants brought in enough money to pay all expenses and send profits of almost $5,000 to The Land Trust for Tennessee’s West Meade Conservancy fund! Thanks and admiration are due to the dedicated, hard-working, creative, and SUCCESSFUL Run-for-the-Hills committee–Chairman, Tina Allocco; Co-Chairman, Marna McKinney; Stasia Holdren, Rob Keese, Kim Matthews, Colleen Prim, Elaine Purdy, and Becka Rosenblatt–and to everyone who helped them with the event. See photos and details here. Sponsors’ names are posted on our Home Page; please thank them by giving them your support. NOAH AND THE ARC Ready for Bookshelves in Nashville and Beyond! The hard-cover, full-color, 10″x8″ book tells the story of the beginning and the mission of The West Meade Conservancy. It explains the importance of West Meade’s woods to the city of Nashville and ends with the determination of a growing group of citizens dedicated to preserving those woods for future generations. The 64 pages are filled with photos taken by Conservancy members. The cover announces “by The West Meade Conservancy,” so if you’ve supported the WMC’s mission, you are one of the authors! The book is designed for readers of all ages, and the photos are labeled to make identification (and learning) easy. There are, of course, lots of box turtles. The book is a fund-raiser as well as an educational tool. Help the cause by purchasing copies to keep and to give as gifts and by spreading the word. The price for hand delivery (within West Meade) is $16.95 per book; for mailed delivery, $19.95 per book. You can see sample pages and order directly from this website, or by calling one of the following people: Jane Bibring (356-0977), Sharon Charney (352-8875), Alys Venable (356-2423), or Anne Williams (352-0412). Your help is needed! If you’ve got ideas for marketing–slogans, venues, contacts, events–, contact one of the people above. You can make an important contribution to the project. Tracks and Sign of Insects and Other Invertebrates, of which Noah Charney (WMC’s founder) is a co-author, won the 2010 National Outdoor Book Award, Nature Guidebook category!